The Solitary or Collared Lory is an endangered species that is endemic to the larger islands of the Fiji, and on the Lau Islands outwards to Lakeba and Oneata. Fossil evidence shows that it once occurred in Tonga - an island group southeast of Fiji, but early human settlers caused its extinction. 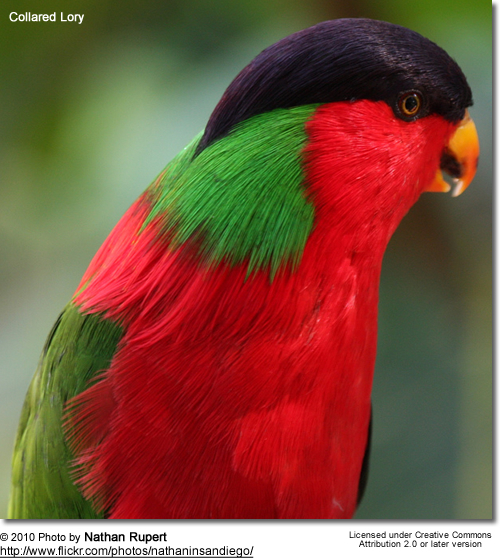 This lory is mostly found in subtropical or tropical moist lowland forest areas, but it has adapted to urban landscapes and can be found in Suva - the capital and largest city of Fiji. 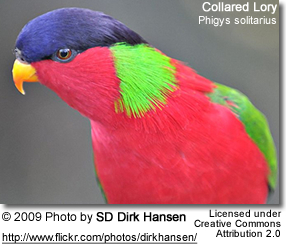 The Collared Lory is usually found in pairs or small groups. 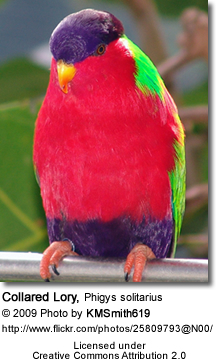 The Collared Lory tames readily in captivity but early attempts to keep birds alive proved difficult - probably because of their specialized diet. Measuring 20 cm (8 in), it has bright red underparts and face with a purple crown and greenish upperparts.. The male has bright scarlet cheeks, throat breast and upper abdomen, a dark purple crown and lime green and red nape. His wings, back and tail are greenish. The lower abdomen is purple. The bill is yellow-orange, the feet fleshy pink and the irises are red. The female is similar but with a paler crown. They usually nest in tree cavities or, at times, in the hole of a rotting coconut that is still attached to a tree. The clutch size is usually about two eggs that are incubated for 28 - 30 days. The young fledge when they are about 9 weeks old. Their main diet consists of fruit, seeds, nectar and blossoms. They favor the Drala (Erythrina variegata), the Coconut Palm (Cocos nucifera) and the African Tulip tree. 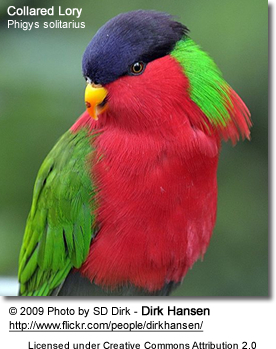 The Collared Lory emits high pitched single or double shrieks. The Solitary or Collared Lory is an incredible little lory found on the larger Fijian islands; Lau Archipelago south to Lakemba and Oneata. The sexes are alike, with the forehead, lories and crown, as well as the abdomen being a deep purple. It gets its common name "collared" from the elongated bright green feathers on the hind neck and mantle. These feathers can be erected from each side, forming two fans on the side of the head. The red feathers in the mantle are elongated as well. The wings are dark green and the rump is light green. The remainder of the plumage is red. The bill is orange and the legs and feet are pinkish. Length: 71/2 in. I have in my collection a bird that is certainly a very close relative of this beautiful specie. It is a Kuhls Lory ( Vini kuhlii). 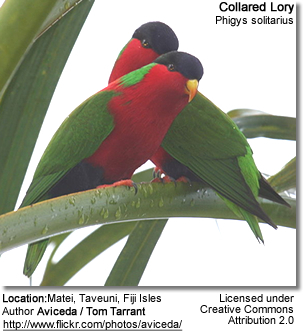 Not being a taxonomist I can't swear to it, but they are similar in so many areas That I would suggest that P. solitarius (the only member of it's genus, by the way) is most closely related to the little Vini (which also includes the beautiful Tahitian Blue Lory V.peruviana). In fact, the only place in the U.S.A where you can see both of these species is at the San Diego Zoo. 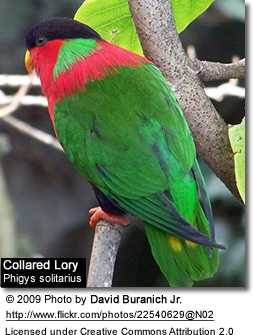 The Solitary Lory has never been common in captivity, with the first importation into Europe occurring in the 1870's. That's 15,00 miles by boat! The next report in England was in 1925, then the famous Duke of Bedford had them in his collection, where he bred them in the 1930's. There is no report of them having been bred in the US, although the San Diego Zoo had them in 1970. They have been bred on several occasions at Taronga Park Zoo, Sydney, Australia. The noted Swiss aviculturalist, Dr. Burkard had bred them into the third generation in the late '70's. They still seem to be quite common in the wild in Fiji, where large flocks of them can be seen feeding in the coconut palms along the seashore. I spoke with longtime aviculturalist Gail Worth about her recent trip to Fiji . She said the lories were everywhere, in the towns as well as in the outlying areas. They fly at a remarkable rate of speed, looking like nothing more than a brief flash of color zipping through the trees. There favorite food in Fiji seems to be the flowers of the coconut palms, where they feed on the pollen and nectar. They also consume other flowers as well as soft fruits. With the changes in the import laws, and Fiji's refusal of wildlife exports (except to Zoos) it certain, and rightfully so, that this wonderful specie will never be in the pet trade. It is hoped by many fellow "loriculturalists", that a few pairs will trickle into the hands of able, private breeders, where we can try our luck at establishing this feathered gem in aviculture. Due to their endangered status, any suitable specimen that cannot be released back into their natural habitat (native range) should preferably be placed into a well-managed breeding program to ensure the continued survival of this species.